2015-16 Upper Deck Fusion ePack Hockey has the look and feel of a new NHL release but with the added twist that it is only found on Upper Deck ePack. While most of the cards are digital, card sets can be collected to produce a physical reward. 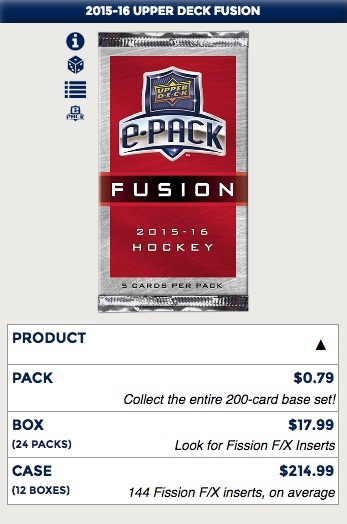 2015-16 Upper Deck Fusion ePack Hockey consists of a 200-card base set along with multiple parallel tiers. Taking that further, individual player cards can be combined to yield more limited parallels. 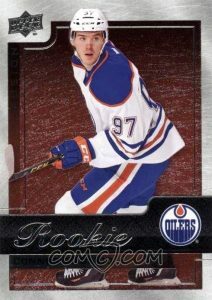 For instance, five copies of the base Connor McDavid card can be turned into a digital Gold parallel. Pushing ahead, five Gold parallels McDavid (or any other player in the set such as Jack Eichel below) yields one Black parallel. 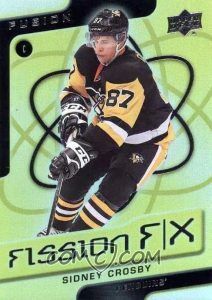 While there are not a ton of inserts to chase in 2015-16 Upper Deck Fusion ePack Hockey, yellow Fission F/X (1:2 packs) are the main choice with 45 cards. Similar to the base cards, these can also be grouped for rare parallels. Five base Fission F/X inserts for one player can be combined for a Blue parallel, which, in turn, can be made into a Green parallel with five Blue copies. The 2015-16 Upper Deck Fusion ePack Hockey physical component comes into play when collectors make the full base set or Fission insert set. Collectors who compile either the 200-card base set or 45-card Fission set in either base or parallel versions will receive a related parallel set that can be mailed to you in physical form. The physical cards can be redeemed through Check Out My Cards (COMC). For the base set, this means a 10-card Fusion Rookie Achievement set in either regular, Gold or Black, depending on the set you made. The full Fission F/X is awarded with a physical, six-card Fission F/X Achievement set in base yellow, Blue or Green. 2015-16 Upper Deck Fusion ePack Hockey pricing starts at $0.79 per pack and boxes go for $17.99.